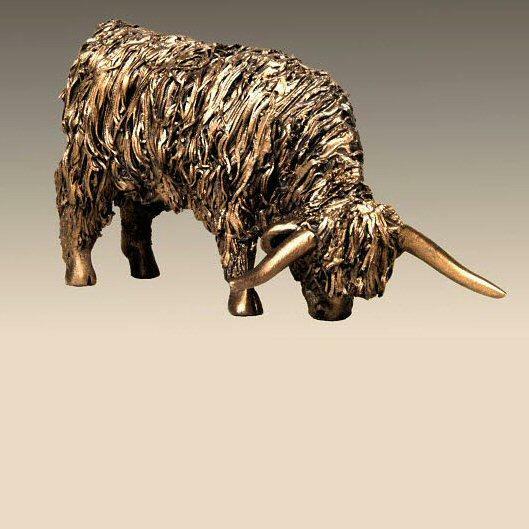 Highland cow grazing from the Frith collection - crafted in bronze by master animal sculptor Veronica Ballan. An ancient breed, Highlanders are highly prized for their ability to thrive in the most inhospitable of conditions. Instantly recognisable by their horns and long shaggy coats - their horns are part of their survival kit, enabling them to dig through snow and ice to reach food in the depths of winter. Celebrate these unique animals with this substantial, and beautiful sculpture in hand finished, cold cast bronze - a worthy addition to any collection or a fine gift. Supplied securely boxed and packaged.